Kratos is back this week at retail, but on the PS Store, Darkstalkers Resurrection is stealing the show. We get a couple of nice demos including one for Army of Two: The Devil’s Cartel and another for Ninja Gaiden 3: Razor’s Edge. 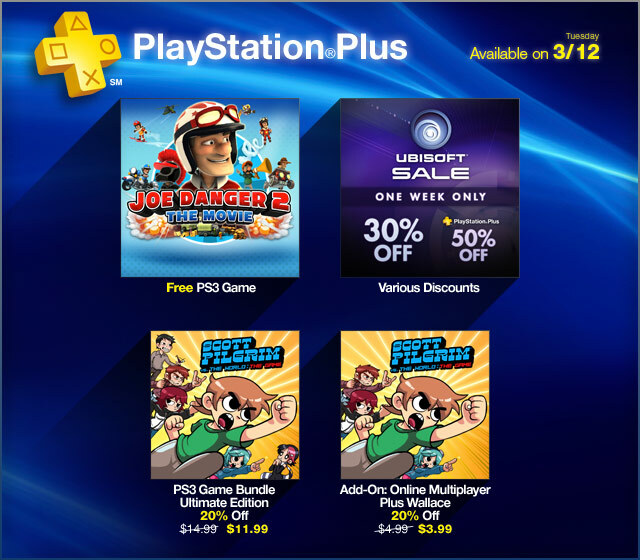 A half dozen imported PS one Classics can be picked up for under $6 a piece, and PS Plus subscribers can nab Joe Danger 2: The Movie for free. Don’t miss the Ubisoft sale and other assorted promotions. Darkstalkers Resurrection updates to two games for the price of one – Night Warriors: Darkstalkers Revenge and Darkstalkers 3. These feature classic gameplay and unique characters as well as a host of new features, including a variety of HD visual modes, online play with 8-player lobbies, YouTube replay sharing, improved challenge modes, dynamic awards, and unlockable extras. Embrace the dark! Explore your creativity, master your emotions, and propel your perception to new heights with Psych Yourself! The follow-up to Test Yourself: Psychology, one of the top-selling indie PSN games of 2011, Psych Yourself comes loaded with fun tests designed to evaluate your Creativity, Emotional IQ, and Perception, so delve into the depths of your psyche and Psych Yourself today! ‘Puzzle by Nikoli V Sudoku’ contains 50 sudoku puzzles. ‘Sudoku’ is a puzzle in which you place numbers from 1 to 9 into a 9×9 grid, divided into horizontal and vertical lines and 3×3 blocks, filling up all of the spaces with the numbers. A chaotic real-time strategy RPG where dozens of characters battle it out for control of Logres. Test your mettle as you command your troops in combat against other would-be kings. Form alliances to ensure your conquest and bring peace to the land. Enjoy the classic game of mahjong as you square off against 3 adorable fortune tellers. Even if you can’t claim strategic superiority, your opponent will still gladly read your fortune and await a rematch. Train hard to prove your abilities as a mahjong master and defeat all challengers. Race across 16 of the fastest tracks in the TransInternet Speed League and come in first over your equally reckless competition. Experience the timeless classic of The Wizard of Oz reimagined in a fantastic new adventure. Little Dorothy has found herself in the mysterious land of Oz and must solve her problems with the use of special magical items. Can you return peace to the magical land beyond the rainbow? Follow the yellow brick road straight to the cutest RPG you’ve ever seen. Growing up, you were constantly moving from one town to the next. You didn’t really have time for friends or romance. One day, you receive a letter that changes everything with one simple sentence: “I want to see you…” Who could have possibly sent this? In your head you’ve got this secret admirer narrowed down to one of the 12 girls you met during your tumultuous childhood. Immerse yourself in this classic dating simulation and uncover the secrets of this mysterious letter. Welcome to the exciting world of TRUMP! Enjoy 10 of the most popular card games around including Seven Bridge (the Japanese version of Rummy), Speed, Blackjack, Poker, and more! Command the various Chinese factions vying for power in this historical fantasy based on the Romance of the Three Kingdoms novel. SCOTT PILGRIM VS. THE WORLD Ultimate Edition includes the Full game, plus the Knives Chau Add-On Pack and the Online Multiplayer + Wallace Pack. Looking for a game to play with a friend? Try out the definitive pure co-op game for an over-the-top, explosive action experience! Download the demo today! Karma, skills, and other data acquired in the demo version can be transferred to the full version.